Order by the Cut: Choose from our list of beef including steaks, roasts, ground beef and more priced per pound. Visit our shop to place your order! We have been working hard on our breeding program to develop a herd that is best suited for grass-finishing, our climate and the land. We have a herd of Belted Galloway Cattle. The Belted Galloway is a heritage breed from Scotland known for their superior taste when finished on grass alone. They are a hardy breed with a double hair coat, which puts those good Omega 3 fats into the meat. The result is a well marbled steak and a flavorful burger. 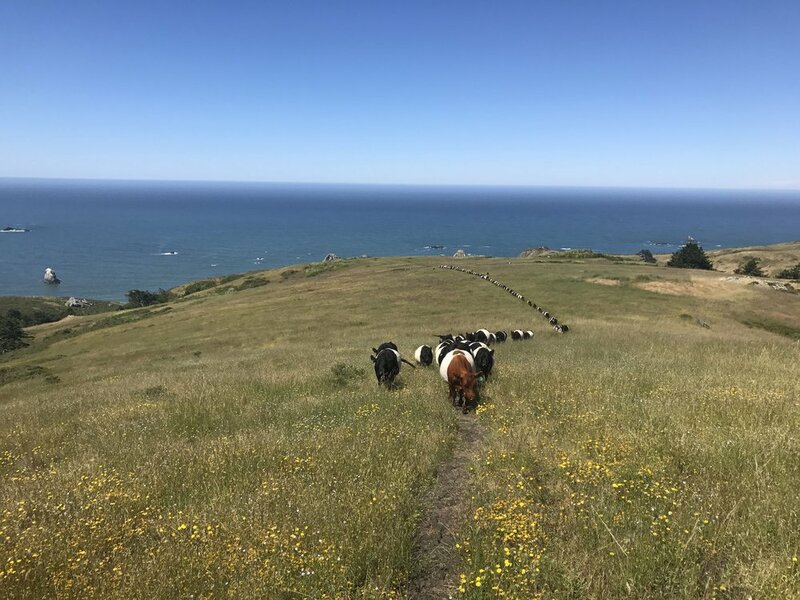 You will taste the difference of beef that is raised on the coastal hills of California - where the salt air and the fog keep the grasses green and nutritious. Check out the video gallery for more images of Markegard Family Ranch Land, or come see for yourself at a ranch day!